So you know I like to keep you up to date with what hair products I'm using... A few months ago my hair started to get a little dry so I decided to change my routine up a little bit. I think my hair gets used to products really easily so I've started switching it up, but staying loyal to the brands that I know work and I trust. 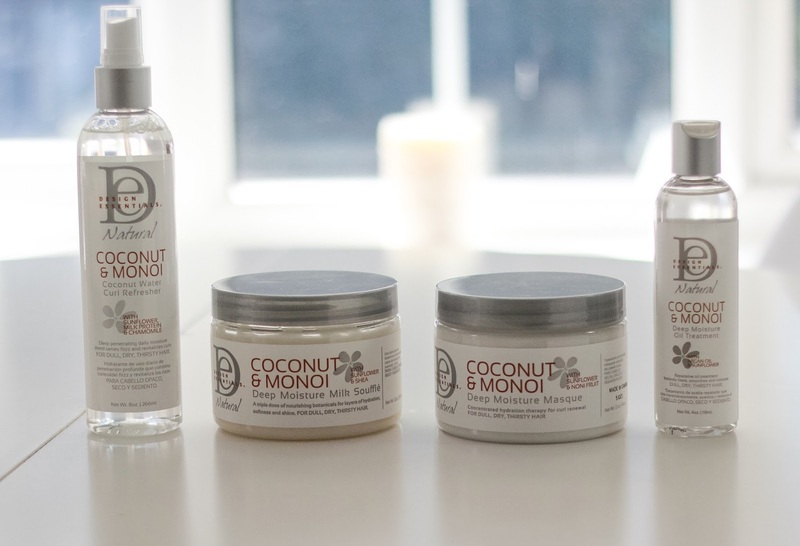 In last month's Curly Hair Routine post I talked about the Design Essentials Almond and Avocado Sulphate Free Shampoo and how much I love it. This is still true, I'm still absolutely in love. So I decided to try out a few products from the Design Essentials Coconut & Monoi line in an attempt to quench these curls. This line is so gorgeous! It smells sooooo good and all the products leave my hair feeling soft and hydrated but without being weighed down and greasy. I'd say the MVP of the team is definitely the Deep Moisture Masque, which I advise you all to try. I'm currently using the Souffle and the Masque instead of the SheaMoisture Jamaican Castor Oil products and my hair seems to be really appreciating the change. I'll be posting a video this weekend on my updated curly hair routine... watch this space! Are you using Design Essentials any products, if so am I missing out on any key products?